Dream Fetchers, a 501 (c) 3, is a non-profit organization dedicated to the belief that through the unconditional love and support of an animal, any individual, in spite of their diagnostic or medical challenge, can be touched and encouraged by a friendly pup through a program of learning and engagement. Our programs bring persons and animals together to interact and bond, offering a wonderful distraction from pain, depression, hopelessness, and/or frustration; which we believe helps promote healing and well-being. Dream Fetchers focuses on the rescue, training, providing services of animal assisted activities/therapies, and community education of dogs through our five unique projects. Dream Fetchers, a 501 (c) 3, is a non-profit organization dedicated to the belief that through the unconditional love and support of an animal, any individual, in spite of their diagnostic or medical challenge, can be touched and encouraged by a friendly pup through a program of learning and engagement. Our programs bring persons and animals together to interact and bond, offering a wonderful distraction from pain, depression, hopelessness, and/or frustration; which we believe helps promote healing and well-being. 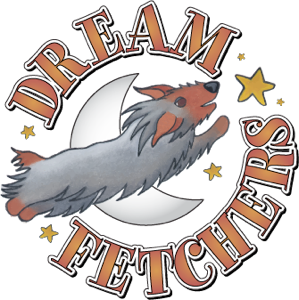 Dream Fetchers focuses on the rescue, training, providing services of animal assisted activities/therapies, and community education of dogs through our five unique projects.